Author William Paul Young discredits his infamous book/movie ‘The Shack’? Home › Resources › Author William Paul Young discredits his infamous book/movie ‘The Shack’? Chris Rosebrough from PirateChristian.com and Tim Challies from Challies.com have clearly demonstrated that the theology ticking under the popular book and movie ‘The Shack’ is dangerous to any person who believes its message. 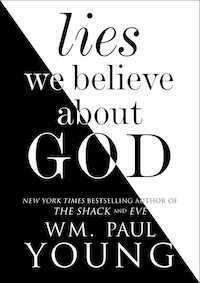 They have done so by examining what the author, William Paul Young, believes in his new book called ‘Lies We Believe About God’. “William Paul Young, the author of ‘The Shack,’ he has a brand new book out. I mean literally, just came out on March seventh. So two days ago. Came out two days ago. The name of it is ‘Lies We Believe About God’. Clearly, this book’s release was intentionally designed to coincide with the release of The Shack movie out in theaters. And listen. The best way I can put this is that uh, if you ever had any doubts about what it is that William Paul Young believes, don’t worry. Tim Challies in his article below also addresses how William Paul Young’s new book has exposed his famous work ‘The Shack’ for the dangerous piece of literature it really is. At least, that was the case until the release of his new non-fiction work Lies We Believe About God. In this book he tells what he believes about sin, religion, hell, substitution, submission, salvation, and a number of other issues that cut to the very heart of the Christian faith. He does this by addressing a series of twenty-eight “lies” people—evangelicals, that is—tend to believe about God. In Baxter Kruger’s foreword he insists that Young “is standing in the mainstream of historic Christian confession.” For the sake of time and space, I cannot evaluate that claim against all twenty-eight chapters. Instead, I have chosen to focus on the few that are most central to the Christian faith. In this section I provide a brief overview of the most important chapters in Lies We Believe About God. As much as possible, I allow Young to speak in his own words. Chapter 2: “God is Good. I am not.” This chapter looks at the human condition. “Many of us believe that God sees us all as failures, wretches who are utterly depraved.” But the reality, he insists, is far different: “Yes, we have crippled eyes, but not a core of un-goodness. We are true and right, but often ignorant and stupid, acting out of the pain of our wrongheadedness, hurting ourselves, others, and even all creation. Blind, not depraved is our condition.” First falls the doctrine of human depravity. Chapter 3: “God is in control.” Close behind it is God’s sovereignty. Christians often state that God has a plan for our lives, even through pain. “Do we actually believe we honor God by declaring God the author of all this mess in the name of Sovereignty and Omnipotent Control? Some religious people—and Christians are often among their ranks—believe in grim determinism, which is fatalism with personality. Whatever will be, will be. It happened. And since God is in charge, it must be part of God’s plan.” He insists that God is not sovereign, but that he “submits rather than controls and joins us in the resulting mess of relationship…” As we will see, this idea of God’s submission to humanity is one of the book’s most prominent themes. Chapter 5: “God is a Christian.” In chapter five Young means to show that it is futile and even dangerous to concern ourselves with who is a Christian and who is not. “Believing (trusting) is an activity, not a category. The truth is that every human being is somewhere on the journey between belief and unbelief; even so, we perpetuate the categories of believer and unbeliever.” Rather than seeing people as being believers or unbelievers, we should understand that we are all on the same path, though in different locations along it. Chapter 13: “You need to get saved.” Here he turns to the matter of salvation. I will excerpt this at length so you can see his full-out embrace of universalism—that everybody has been or will be saved by God. Here’s the truth: every person who has ever been conceived was included in the death, burial, resurrection, and ascension of Jesus. When Jesus was lifted up, God “dragged” all human beings to Himself (John 12: 32). Jesus is the Savior of all humankind, especially believers (1 Timothy 4: 10). Further, every single human being is in Christ (John 1: 3), and Christ is in them, and Christ is in the Father (John 14: 20). When Christ—the Creator in whom the cosmos was created—died, we all died. When Christ rose, we rose (2 Corinthians 5). Young leaves no doubt that he espouses universalism. To further his argument, he includes an appendix on the matter. Chapter 15: “Hell is separation from God.” Having advocated universalism, he must now say something about the tricky matter of hell. “I may have convinced myself or been convinced by others that I deserve to be separated from God. Such lies will bring with them a shadow in which I experience a sense of separation, feelings that seem to validate the illusion that God is not connected and in relationship with me or that God has stopped loving me or has given up on me. Many of us on the planet live in this illusion now. … I propose the possibility that hell is not separation from Jesus but that it is the pain of resisting our salvation in Jesus while not being able to escape Him who is True Love.” Hell, too, falls by the wayside. Chapter 17: “The cross was God’s idea.” Should we be surprised that he now moves against the notion that the cross was somehow part of God’s divine plan? He borrows Steve Chalke’s language of “divine child abuse” to describe any God who would plan such a thing. If God did, then we worship a cosmic abuser, who in Divine Wisdom created a means to torture human beings in the most painful and abhorrent manner. Frankly, it is often this very cruel and monstrous god that the atheist refuses to acknowledge or grant credibility in any sense. And rightly so. Better no god at all, than this one. The alternative is that the Cross originated with us human beings. This deviant device is the iconic manifestation of our blind commitment to darkness. It is our ultimate desecration of the goodness and loving intent of God to create, an intent that is focused on the human creation. It is the ultimate fist raised against God. And how did God respond to this profound brokenness? God submitted to it. God climbed willingly onto our torture device and met us at the deepest and darkest place of our diabolical imprisonment to our own lies, and by submitting once and for all, God destroyed its power. Jesus is God’s best, given willingly and in opposition to our worst, the Cross. When did God submit? Not only in Jesus incarnate but before the creation of the world, according to Scriptures (Revelation 13: 8). God knew going into the activity of creation what the cost would be. That God’s own children, this highest order of creation, would one day make the final attempt to kill Life. And how would we religious people interpret this sacrifice? We would declare that it was God who killed Jesus, slaughtering Him as a necessary appeasement for His bloodthirsty need for justice. Now that Young has described what he believes, his fans would do well to return to The Shack, for he has settled many of the debates. Does The Shack teach universalism? Absolutely. Does it encourage people to turn to Jesus Christ in repentance and faith? Is it meant to compel people to come to deeper confidence in the Bible? Is it a book that will persuade people to join and serve a local church? No, no, and no. Years ago when I reviewed The Shack I said, “Despite the amount of poor theology, my greatest concern is probably this one: the book has a quietly subversive quality to it. Young seems set on undermining orthodox Christianity.” “Seems set?” Now we know he isset. He is set on revoking and replacing the very pillars of the Christian faith. Before I conclude, let me offer a few further observations about Lies We Believe About God. While the excerpts above may represent Young’s most significant claims, they are far from the only concerning ones. There is barely a chapter in the book that does not do damage to one or more precious doctrines. Many times these depend on novel interpretations of Scripture passages or on creative word studies. It is a well-established rule of polemics that before we engage another person’s ideas, we must ensure we have accurately understood and presented them. Young seems unconcerned with such protocol. To the contrary, he often lampoons or otherwise misrepresents what evangelicals believe. Time and time again he crafts a sloppy straw man, then beats it into the ground. Young never addresses whether or not the Bible is our ultimate authority when it comes to what is true and what is false. Thus, he rarely proves his statements or defends his own beliefs with the Bible. Even while he dismantles the Christian faith, he often appeals to no authority outside himself. The easiest book to write is the one that asks questions but stops short of proposing answers. This is especially true when the author associates humility with uncertainty and confidence with arrogance. And, sure enough, this is what Young does. “The book is not a presentation of certainty,” he says, as if this is an asset. “None of the examinations of ‘lies’ results in a final or absolute view on a subject. Rather, they are tastes of larger conversations.” Yet the careful reader will observe that Young’s uncertainty does not extend to the claims he believes to be false. When it comes to many core claims of the Christian faith, his uncertainty vanishes and he confidently castigates the positions and those who hold them. Now that I have read Lies We Believe About God from cover-to-cover, one of its small statements seems to take on outsized significance. “To understand who God really is, you can begin by looking at yourself, since you are made in God’s image.” The man who wrote these words has exposed his own approach, for his God is obviously and unashamedly fabricated in the image of Paul Young.